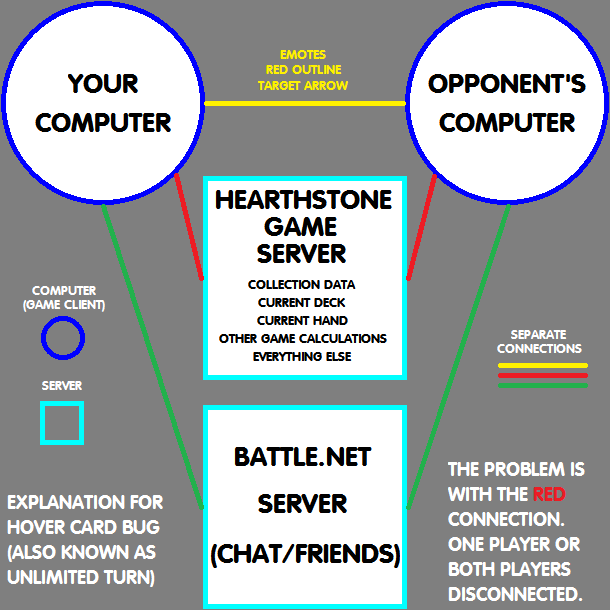 This is in response to a disconnection issue that players see where it appears that the opposing player is holding up the game in some manner. Often it will appear that they are holding a card above the battlefield, purposely preventing the timer from starting. "Disconnect" when used in this case can reference several different areas of the game. It is not always just "my internet is fine, this isn't a connection issue." Something that speaks to this is when players mention that the player is holding a card over the game board and emoting or going through their cards. This should be one sign as to this being a connection issue as you cannot both use your mouse to hold a card over the game board AND click emotes or go through your hand. Since this is due to disconnects, the only time that we need this reported is when it ALWAYS happens from doing the EXACT SAME thing. If it happens every single time you play Fireball, report it. That is a bug.